If you're searching for a game that's fun enough to keep you entertained while the president elections are still running, we have a perfect game for you - your very own chance to help Trump get to the white house. 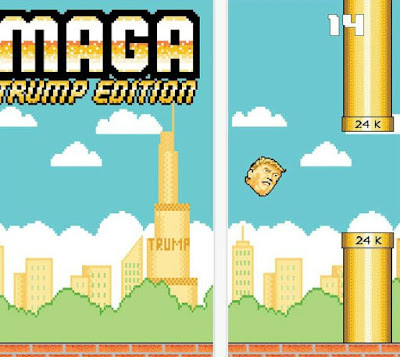 MAGA: Trump Edition is a game that will challenge you to the fullest and will have your attention glued to your phone. Amazing graphics with simple controls, it will totally get you hooked. The developer, Matt Tawil, made it compatible with both iPhones and iPads. MAGA: Trump Edition has a very cool and interesting gameplay features which you may think are easy at first but the real challenge is yet to be experienced. Your one and only mission is to take Trump to the white house. You do that by tapping on the screen and going through the golden tubes on your way. Try not to hit them while jumping and collecting voting pins, all while hearing Trump’s comedic and commanding voice. Keep focused and concentrated, get as farther as you can in order to win high scores. MAGA: Trump Edition is a new game, a new challenge to keep you entertained during the elections. Download it now for free from the App Store and have fun!